The Score Tab is the primary location used to confirm the score of the match prior to Commit Score. The information shown on this tab is input by the Referees using the Touchscreens or by the automated scoring system (except in FMS Off-Season). Manually editing these values can be done through this interface. The total alliance score is automatically recalculated as these adjustments are made. Values are not editable until after the match is over, because values during the match come from the Referees or automation. In FMS Off-Season, values are editable during the match as there are no Referee panels or real time scores. 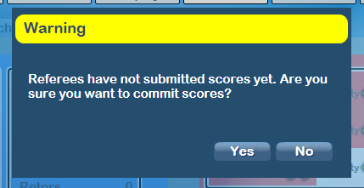 Be careful if you elect to manually score, or edit scores manually, using the score tab! Documentation will show the blue Alliance, but the functionality is the same for the red Alliance. At official FIRST events, all of the data on the score tab comes from automated hardware or certified Referees. The scorekeeper should not edit any values without the supervision and direction of the Head Referee. Light Pink Box / Arrow - The area of the tab highlighted above in light pink is the score tab navigation. With the large amount of scoring data, multiple tabs are used to demonstrate various portions of the Match. Clicking a tab will change the visible page (each Alliance can be on a different tab). 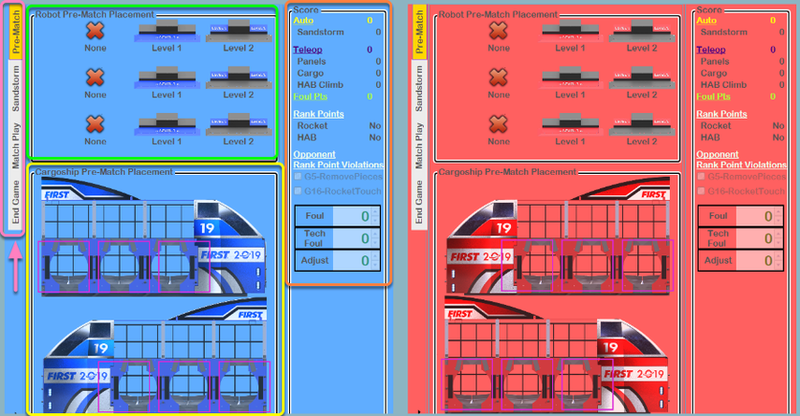 Green Box - The area of the tab highlighted above in green is where Robot Pre-Match status will show. As referees input Pre-Match Levels, they will highlight here. Each team must have either "None" or "Level 1" or "Level 2" selected before starting a Match. Yellow Box - The area of the tab highlighted above in yellow is the Cargoship Pre-Match. Each bay must have a Hatch Panel or a Cargo before starting a Match. The top Cargoship is data from the far side of the Field, the bottom Cargoship is data from the scoring table side of the Field. The Cargoship shown is from the perspective of the Referee entering the data. Orange Box - The area of the tab highlighted above in orange is the score summary. All values in this box are in points, converted from the data in the other areas of the Alliance's score tab, except for the Foul/TechFoul boxes, which are counts. The ranking points area is always shown, but there are no ranking points in Practice/Playoff/Test matches, so they will always say No. Notice that Foul Pts, written in green, are points credited to the alliance, which means they're calculated off the other alliance's violations. Changing the Foul/TechFoul counts on a given alliance will change the score of the opposite alliance. The 2019 game has violations that result in the opposing Alliance receiving Ranking Points. These are shown through the "Opponent Rank Point Violations" checkboxes. The Ranking Point is credited to the Alliance where the checkbox is checked. For example, if the "G5-RemovePieces" is checked in the blue Alliance scoring area, blue Alliance will receive the Ranking Point (meaning red Alliance committed the violation). The Score Tab is made up of four sub-pages. Some data is shared between sub-pages, see previous section for details on those portions of the tab. Green Box - The area of the tab highlighted above in green is for Robot Sandstorm. The team number is shown on the left column, followed by options for whether the Robot crossed the HAB Line during Sandstorm ("During"), during Teleop ("After") or Never ("Never"). Green Box - The area of the tab highlighted above in green is Far Side Rocket data. Panels, Cargo+Panel and None are the potential options in each Rocket Bay. Empty bays show a purple box, matching the activity of the Referee panel. Note: Data in the Far Rocket is from the prospective of "facing" the Rocket (matching where the Scorekeeper is sitting), as demonstrated in the Rocket art. Yellow Box - The area of the tab highlighted above in green is Scoring Side Rocket data. Panels, Cargo+Panel and None are the potential options in each Rocket Bay. Empty bays show a purple box, matching the activity of the Referee panel. Note: Data in the Scoring Side Rocket is from the prospective of "behind" the Rocket (matching the Scorekeepers perspective), as demonstrated in the Rocket art. 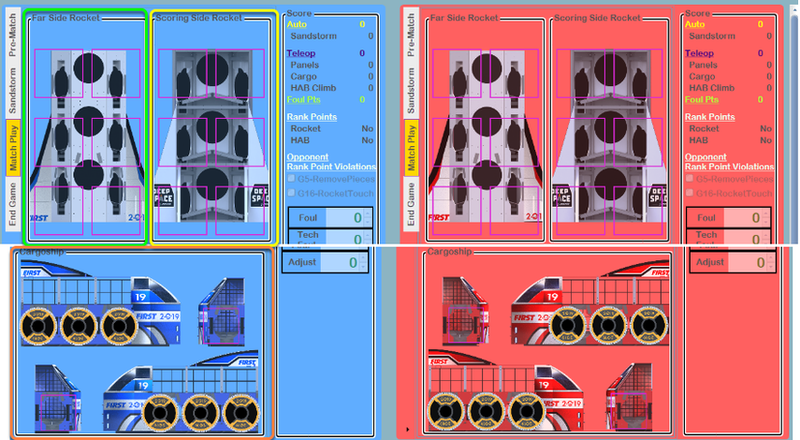 The perspective changes between Scoring Side and Far Side Rockets are done to allow easier review for a Scorekeeper to see Game Pieces and Field Elements from their perspective while seated at the Scoring Table. Orange Box - The area of the tab highlighted above in orange is the Cargoship data. Panels, Cargo+Panel and None are the potential options in each Cargoship Bay. Empty bays show a purple box, matching the activity of the Referee panel. The top Cargoship is data from the far side of the Field, the bottom Cargoship is data from the scoring table side of the Field. The Cargoship shown is from the perspective of the Referee entering the data. Green Box - The area of the tab highlighted above in green is where Robot Endgame/HAB scores will show. Each team must have either "None" or "Level 1 to 3" selected before submitting scores. The left column shows the corresponding team number. If a Scorekeeper attempts to Commit a score before the Referees have completed their scoring of the match, a warning dialog will be presented. If a match is edited after the clock expires, either by Referees or the Scorekeeper, a comment window is automatically opened when the Commit button is pressed on the FCUI. This box can be used for comments regarding why the score was edited after the match ended, and these comments will be saved and available later, should a review be necessary.